or to renew your membership. General Membership (18 years of age or older). Upon completion of an application form (click for the online application or print and submit the application) and payment of $30 in annual dues, a person may become a General Member. All General Members receive a Monthly Bulletin, e-Blasts concerning events of special interest, and are able to participate in All-Member Shows. They are encouraged to volunteer and participate in Guild activities and in its maintenance. The Guild survives on the cooperative spirit of its members. Associate Membership may be granted when five framed works in the same medium are presented to a jury and are accepted for this level of membership. The jury process occurs twice a year, fall and spring. An Associate Membership is a step towards Exhibiting Membership, and if desired, the artist may submit a new portfolio at a later date in order to be considered for Exhibiting Membership. Associate Members’ dues are $45 annually and provide the member with the opportunity to show his/her work in the annual Exhibiting and Associate Members’ Show, the “Small Treasures” monthly exhibits (2 pieces, 14 inches at longest dimension–space allowing), offsite location shows, and to be listed on the Guild’s website with an individual biography page as well as a gallery page displaying up to ten images of the artist’s work. 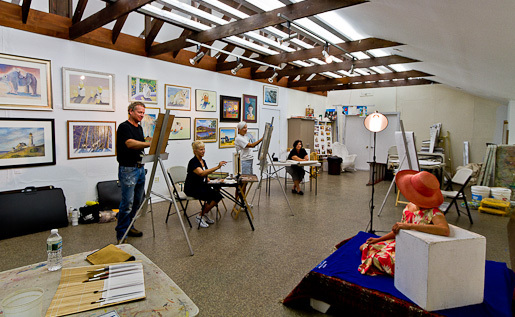 If approved by the Board of Directors, Associate Members may teach classes and workshops and rent the Main Gallery. Associates are welcome to volunteer their services to assist with Guild activities. Applicants for Exhibiting Membership also must submit five framed works of the same medium to a jury for consideration. Once accepted, Exhibiting Members pay dues of $80 annually. They have the privilege of displaying up to four selections (space allowing) of their work each month for a suggested donation of $5 each. The artwork may be no larger than 48 inches in either dimension. Three matted or three prints may also be shown in racks for three months for a suggested donation of $3 per piece—receiving dates are posted in the Monthly Bulletin. Exhibiting Members are able to rent the Main Gallery for solo exhibitions (or with other Exhibiting Members) for one month or rent the Mini Gallery in the reception area for one month. They may participate in the Exhibiting and Associate Members’ Show and All-Member Shows, bring work to offsite locations, and be listed on the Guild’s website, with an individual biography page and a gallery page featuring up to ten images. Exhibiting Members may also teach classes and workshops and be invited to serve on a jury panel. Their participation in Guild activities and its running is essential to maintaining the organization. The Guild offers a discount on General Membership for artists or art lovers with a partner or spouse who is already a General, Associate, or Exhibiting Member in good standing. For an additional annual fee of $5 added to this member’s dues, the spouse/partner may become a General Member and receive all privileges extended to this level. If, however, the spouse/partner submits artwork to the Semi-Annual Jury Committee and is accepted for either Associate or Exhibiting Membership, the accepted artist must then pay the full dues in that category. In no case is an Exhibiting or Associate Member’s spouse/partner automatically granted the level (above General Member) that their spouse/partner has been awarded. If an artist’s level of membership has been raised, either from a General Member to an Associate/Exhibiting Member or from an Associate to an Exhibiting Member, the artist is immediately responsible for paying dues at this new level. Failure to do so may jeopardize the artist’s ability to hold this new level of membership. Membership dues are assessed annually, although those artists accepted for Associate or Exhibiting Membership during the fall jury process, who still must begin paying the higher level of dues immediately after acceptance, may have their dues apply to the following year. If an artist’s Associate or Exhibiting Membership is not paid in full annually, the artist may not teach classes or workshops or take advantage of membership privileges. If dues go unpaid by June 30th, the artist loses his Associate or Exhibiting Member status and must re-submit a portfolio for jurying or pay all the back dues owed.